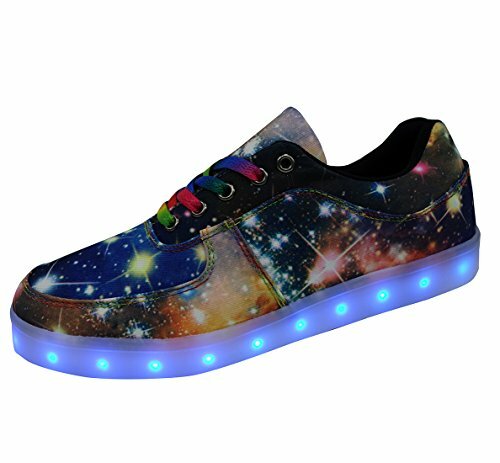 2018 New Styles, Unisex Adults LED Shoes. Special Galaxy Printed Canvas Fabric, with 7 colors LED lights. You best Choices for Shoes! Charge via power bank or PC USB port are highly recommended, two or three hours charge is enough for 6-8 hours use, do not over charge it. You can simply clean the outside of the shoes, do not let water into the shoes. Is Led light shoes waterproof ? Can I wear them in a rainy day? 1. As fabric is allover print, thus the artwork of two shoe won't be exactly the same. 2. All shoes are inspected before sending to make sure they are in good condition. Due to performance of electronic product, the lights might be malfunction after transportation or Strenuous exercise. SIZE TIPS: Size are not standard US size, before order, please check our size conversion in detail description. LIGHTING MODES: total of 11 modes of lighting, 7 fixed colors, 4 flashing modes. SWITCH INSTRUCTION: Hidden switch on the inside of the shoes. CONVINIENT FOR CHARGING:easy chage like your cellphones, you can charge via computer, laptop, power bank or common charger. WONDERFUL GIFT IDEAS: These Shoes are ideal for party, nightclub, Festival, Birthday Gift, Valentine's Day present, Halloween, Christmas, Evening Riding etc. If you have any questions about this product by DAYOUT, contact us by completing and submitting the form below. If you are looking for a specif part number, please include it with your message.